One bite and you will never order BBQ chicken nachos at a restaurant! 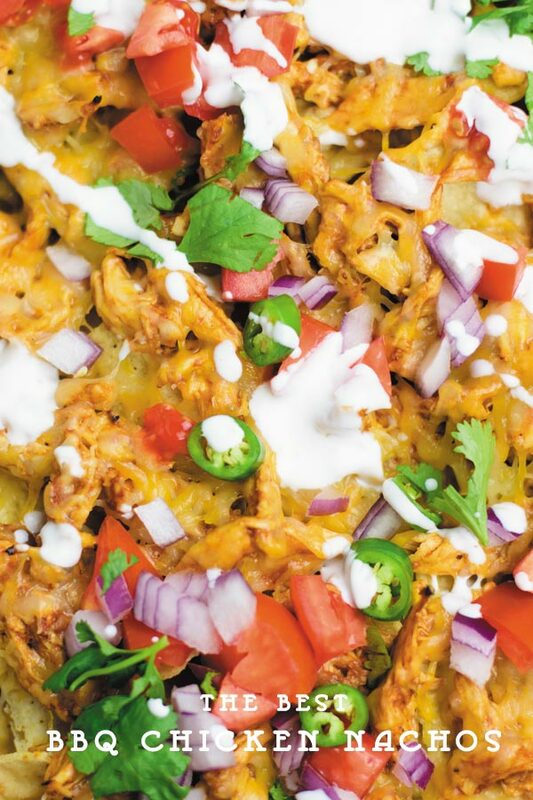 These are the Best BBQ Chicken Nachos loaded with homemade shredded BBQ chicken, loads of cheese, onions, tomatoes, cilantro, serrano peppers and sour cream! After I left you with that awesome recipe for making homemade BBQ Chicken, you knew this was coming! 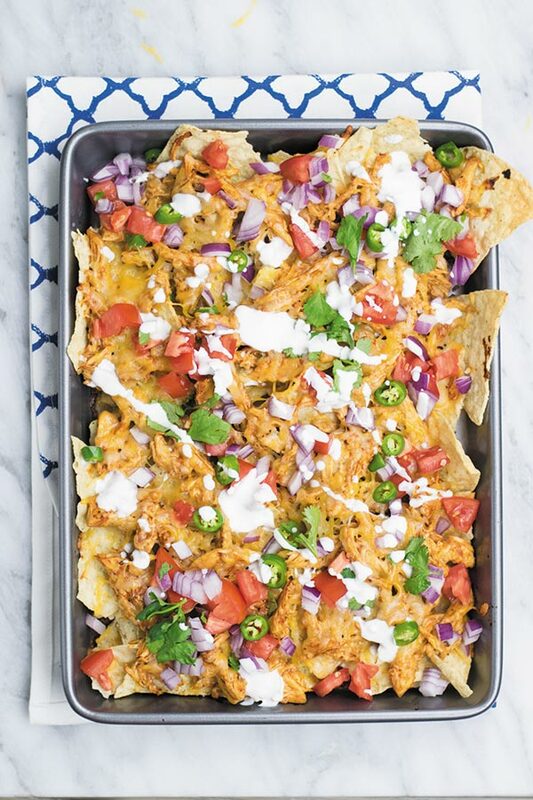 What better way to use homemade BBQ chicken but in nachos – not just simple plain boring nachos but loaded nachos with all the fixings! After eating these, we declared that we are never getting chicken nachos in a restaurant. 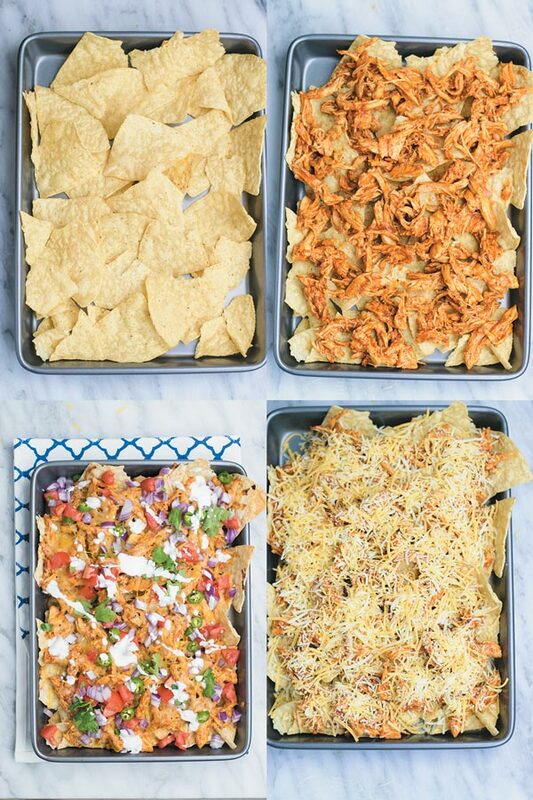 I mean why would we when when can make our own nachos loaded with all the fixings?! Making these is super simple. 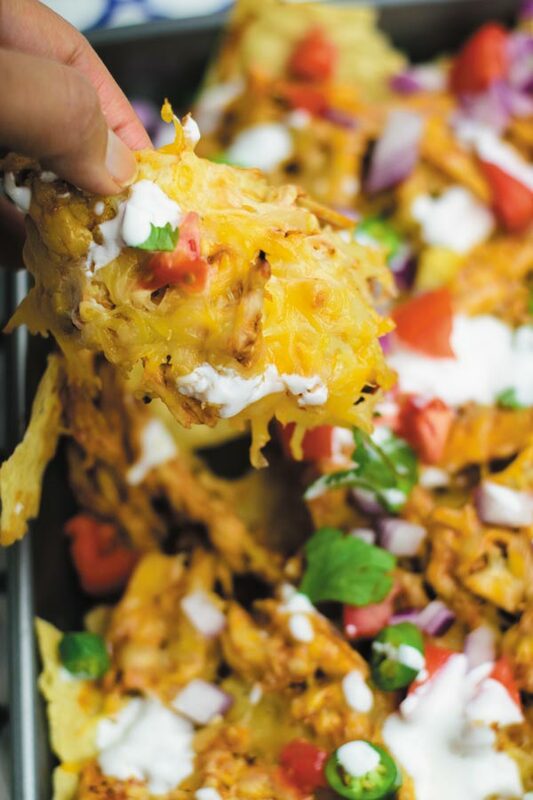 You need amazing tasting BBQ shredded chicken, your favorite tortilla chips, shredded mexican cheese and then all your favorite toppings. I like chopped tomato, onion, cilantro, serrano peppers on mine and then a good drizzle of sour cream! I know you are already drooling and these will make for a delicious dinner tonight! And if you you don’t have time to make your own shredded chicken, just use chicken breasts, cooked and cut up in pieces or use my stove top method to make shredded chicken and then add your favorite BBQ sauce. Go ahead, these + chilled beer + your favorite TV show will make for a perfect cozy weeknight meal! In a sheet pan. layer tortilla chips. Add a good thick layer of shredded chicken all over the chips. Cover the chicken with shredded cheese. Bake in oven for 5-10 minutes or until cheese is completely melted. Keep an eye as high heat makes them get done really quick. Once done with bubbling cheese, add all desired toppings and enjoy! Hi !, your page was recommended by one of my friends. I have tried many of recipes and I must say results have been truly amazing. Above all your recipes are so simple.